young | Masters of What? Today is the third installment of our Young Professional Series (you can see the others here and here)! This interview is with Laura Peterson, a close friend (who Blake has known since pre-school) and K-12 teacher with a passion for education. My favorite aspect about teaching is getting students excited about school and inspiring them to be life-long learners. I love helping students become more confident in academic areas that they previouslystruggled with and motivating them to succeed. As a teacher, I get the opportunity to positively influence students’ lives and to see the progress they have made over the school year. The best thing about teaching is that you get paid for doing what you truly love. As a young teacher in this unfavorable education job market, it is very hard to find a stable, full-time, high paying teaching job. However, I have found that I am able to “brand” myself by showcasing my strong attributes and being assertive both in an interview and job setting. I make sure to go out of my way to get to know other faculty, especially the veteran teachers and administration, so they know I am a “team player” and ready to help out as much as possible. I also make sure I am very fun and caring towards my students so that they will want to report back to their families with positive feedback about my teaching. As for parents, I make sure they feel welcome and know that there is open communication to meet with me and share their thoughts and concerns about their child. What’s the hardest thing about finding a teaching job right now? How do you stay positive in your search? Due to severe budget cuts and teacher layoffs over the last few years, I have struggled with finding a permanent teaching job, which can be very disheartening at times. Teaching is my passion, therefore, I try to stay positive and remind myself that all the applications were worth it and that I will ultimately land the perfect job I want. Even though it is not ideal, I do feel that each part-time job and tutoring position I have taken over the years was still building my resume, adding to my overall experience, and making me more valuable for when the right job comes around. Have you seen similar difficulties out there when you’re job hunting? How do you stay positive? For the second installment of our young professional series, we went to our other third, Whitney. Besides being a bestie to both of us, she also does both of our hair. In fact, it was probably fifth grade when she first dyed Nicole’s hair. What is your favorite thing about being a hair stylist? My favorite thing about being a hair stylist is that every day is completely different, and with that, brings new challenges to achieve the hair my clients have pictured. It also allows me to be very creative and be hands on with people. Whitney doing hair for a wedding. As a hair stylist you don’t simply do hair, but you are also a business owner. What do you do to promote your business? As a small business owner, I rely mostly on referrals. To encourage my clients to refer me, I offer rewards for each new client they send in. If I’m having a slow day it’s best to hit the streets and meet new people by walking around and passing out business cards and putting my face and name out there. As a hairstylist, how important is your personal brand? At the salon we really try to build a whole salon brand, not so much an individual brand because we’re a team and able to reach more people as a unit rather than individual. People often compliment the atmosphere and us being a family and working well together. Clients want to feel welcome and a positive energy from everyone in the salon, not just one person. Are you allowed to have a bad hair day? No, I’m not allowed to have a bad hair day. If I’m having trouble with my do one day, luckily I have nine other stylists who can put me together. Want to make an appointment with Whitney? 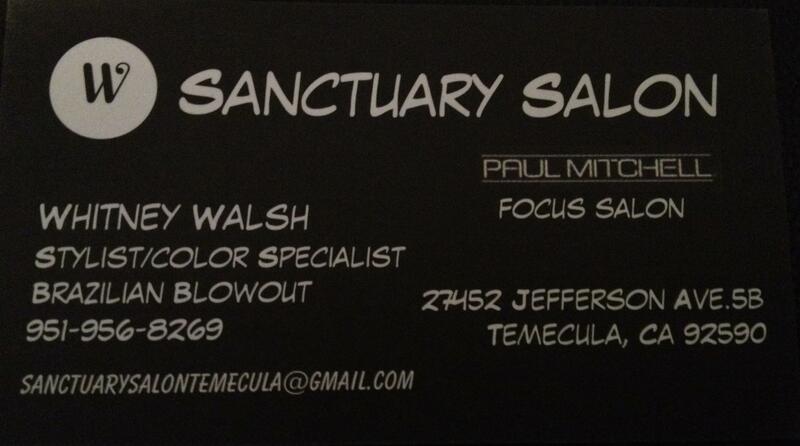 Call Sanctuary Salon at 951-956-8269 or check out their Facebook Page! Call Whitney if you want to look and feel great. The drive to Temecula is way worth it (if you are in SD like us) and you can always hit up some wineries after being pampered!